We are raising children in an age where there seems to be more worry and fear about everything, and less ability to persevere and cope in the face of adversity. Our modern day technological culture promotes doing things easier and quickly. Exerting the least amount of effort for the greatest impact and reward seems to be most valued. "Dad, I don't think I want to do this... it looks too scary... it's too steep... I don't know how we will get down... those look like rain clouds." We were at the top of Sub-dome, staring up at Half Dome in Yosemite. 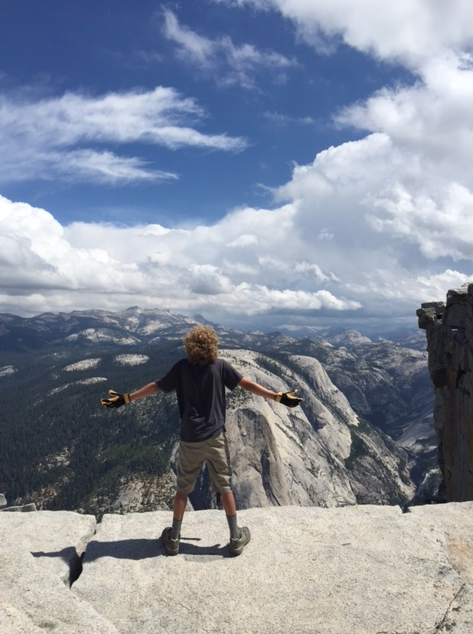 We, along with two other father-son teams, woke up at 4:30 a.m. to climb Half Dome. About six hours later we were looking at our goal -- climbing the cables to peak Half Dome. We had watched the videos and were aware of the safety warnings. Most injuries and deaths are due to taking chances with the weather and the cables. If you respect the weather and the cables, you will be okay. Some people were climbing up, others were staying put and saying, "It looks good to me from here. I have seen it and I am not taking any chances." My son continued to question whether we should do it. Little did he know that I was thinking all the things he was saying. I said sincerely, "You have done great. This is a big hike. We don't have to do this." I half hoped he would decide to do it and half hoped he would choose not to. It was scary. It was steep. I wondered if I was taking an unnecessary chance with his life, and my own. As someone who has spent a good portion of his career working with people to overcome worry, fear, and perfectionism (and being very familiar with these myself), I dug into my mental toolbox. I starting using self-talk to calm my mind and slow down my rising fight and flight response and beating heart as I said to myself, "Many people do this all the time... this is a choice... you don't need to do this... everyone will think the same of you if you choose not to do it...you don't have to prove anything... you can do this if you want to... it will be okay." As I talked to myself, I felt calmer and was able to focus clearly on my son. I told him that it was up to him and if he wanted to do this I would be right behind him every step of the way. If he slipped, I would catch him. I told him I knew he could do it but if he didn't want to he would still be the same person he is right now. He looked at me and said timidly, "Ok, let's do it." I seized the opportunity since there were few people on the cables and it wasn't helping that someone close to us kept saying he liked his life more than peaking Half Dome. "Ok" I said, "Let's do this." We climbed, step after step, holding the cables with a tight grip. Half way up, it became very steep. He stopped and said, "I don't know how we are going to get down. It's too steep." Back to the toolbox -- focus on the present. "We are not going down now, that is later. We are going up now. Focus on one step at a time. Only focus on each step. That is all that matters right now." "Ok" he said, and started climbing again, one step at a time. 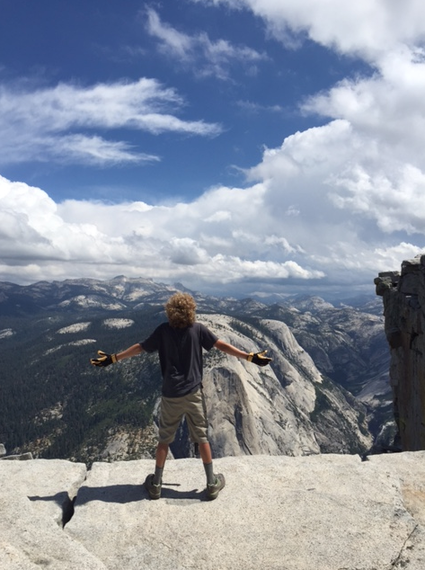 Before long, we were standing on Half Dome and feeling like we were on top of the world. "You just peaked Half Dome," I said as I gave him a high five. We were both panting. He tried to hide his smile but he couldn't. He did something he didn't think he could do. The way down the cables was far easier than anticipated. He did not have fear on the way down. He was more confident and commented that descending was easier than he thought. About 12 hours after we woke up that morning we finally arrived back at our tent. We were totally spent. Often a person of few words, my son said, "That was the hardest thing I have ever done." At that point, that was possibly the most gratifying statement I could have heard. We are raising children in an age where there seems to be more worry and fear about everything, and less ability to persevere and cope in the face of adversity. Our modern day technological culture promotes doing things easier and quickly. Exerting the least amount of effort for the greatest impact and reward seems to be most valued. I didn't realize how much hiking Half Dome would offer the opportunity to get out of our comfort zone, question our ability, need to manage real (and appropriate fear), and work together to do something we weren't sure we could do. This experience reinforced the important notion that we need to provide experiences for our children to push themselves, get out of their comfort zone, learn to manage their worries and fears, and experience earned and real success. We need to help them learn to dig deep in order to grow. It also taught me that we are never too old dig deep or climb high.